Do you use a tough combination of numbers to unlock your iPhone? If you don't, you're leaving your phone vulnerable to access in the case of loss or theft. According to new research, many iPhone users may choose the same or similar passcodes, some of which are pretty easy to guess. Daniel Amitay, developer of remote security app Big Brother Camera Security (which can take photos of someone trying to access a lost or stolen iPhone via the device's webcam) has done some anonymous analysis of the passcodes iPhone users choose for the app. "Because Big Brother's passcode setup screen and lock screen are nearly identical to those of the actual iPhone passcode lock, I figured that the collected information would closely correlate with actual iPhone passcodes," writes Amitay. Recording 204,508 passcodes, Amitay picked out the top ten most commonly used. Far and away, the most commonly used code was "1234," with a total of 8,884 users choosing this number combo. The second most popular key--"0000"--was the code of choice for 5,246 users. In third place was "2580," which draws a straight line down the keypad. This combination was favored by 4,753 users. Fourth place belongs to "1111," with 3,262 users. The code "5555" comes in fifth with a much smaller number of users--1,774. "Most of the top passcodes follow typical formulas, such as four identical digits, moving in a line up/down the pad, repetition," Amitay notes. "5683 [the sixth most popular] is the passcode with the least obvious pattern, but it turns out that it is the number representation of LOVE (5683), once again mimicking a very common internet password: "iloveyou." Amitay's research also shows that the number one (1) was most commonly used at the first digit of a user's passcode. 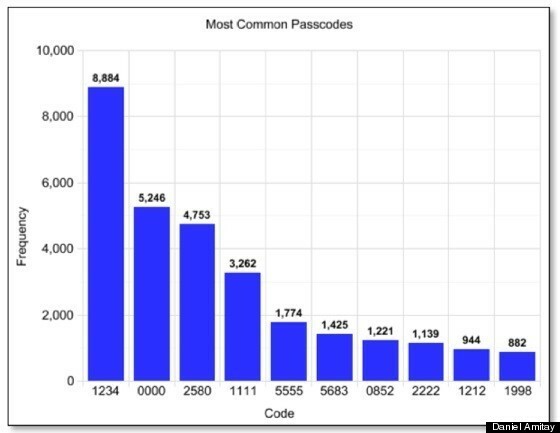 Out of the 204,508 passcodes Amitay tested, the number one (1) appeared at the head of over 57,000 codes. Formulaic passwords are never a good idea, yet 15% of all passcode sets were represented by only 10 different passcodes (out of a possible 10,000). The implication? A thief (or just a prankster) could safely try 10 different passcodes on your iPhone without initiating the data wipe. With a 15% success rate, about 1 in 7 iPhones would easily unlock--even more if the intruder knows the users' years of birth, relationship status, etc. Though these figures can't be considered as official iPhone statistics, The Next Web calls them significant nonetheless: "Amitay’s results aren’t collated in an official capacity, meaning there some passcodes may differ from that of a user’s original iPhone passcode. However, a sample of 200,000 people should never be discarded." Take a look at the ten most commonly passcodes (below), based on analysis of Big Brother app users. Then, visit Daniel Amitay's website to read more about his findings.